I LOVE cream of asparagus soup, it’s pure comfort in a bowl and so simple to make. This recipe is made with just 5 ingredients, not counting salt and pepper and is ready under 25 minutes! This healthy, creamy soup is made with no cream, it’s simply pureed with a little sour cream, which you can totally omit if you want to keep it dairy free. I watered a little sour cream down and drizzled a little more on top. Perfect for a light lunch, or to serve with a sandwich or a salad. Creamed soups don’t have to be loaded with heavy cream. There are several ways you can make your own creamy soups. First, get yourself an immersion blender (affil link) if you don’t already own one. This is probably my all time favorite kitchen gadget. It’s so much easier than putting hot soup into a blender in several batches, trust me! The simple act of pureeing your soup once cooked can transform your soup into a creamy delicious soup. This works great with beans, legumes or vegetable soups. To do so, use slightly less broth or liquid than you normally would. Add a potato along with your vegetables to further thicken your soup when you puree. This is great for soups with leafy greens or if you want to make your soup more substantial. Make a roux or a slurry. My dad always made a roux in his creamy cauliflower soup which was my favorite soup growing up. I’ll talk more about making a roux or slurry in a minute. 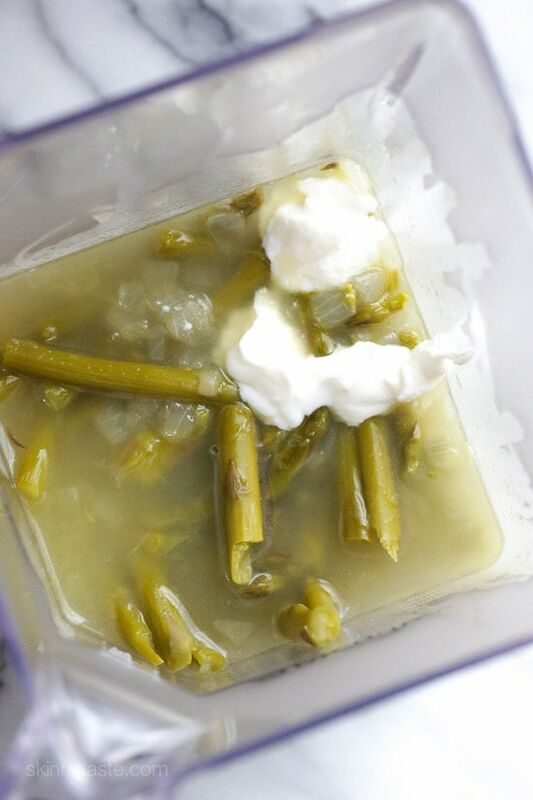 When you want the taste of cream, adding a few tablespoons of sour cream is my favorite way to get that creamy flavor you get from heavy cream as I did in this soup. Melt butter over low heat in a large pot. Add onion and sauté until soft, about 2-minutes. Cut the asparagus in half and add to the pot along with chicken broth and black pepper, to taste. 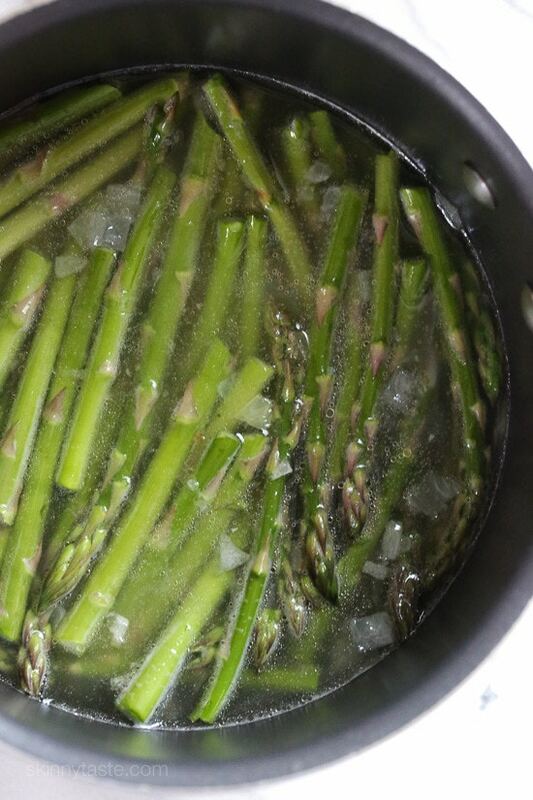 Bring to a boil, cover and cook low about 20 minutes or until asparagus is very tender. Remove from heat, add sour cream and using your hand held blender, puree until smooth (or in two batches in a large blender). Made this soup and it was delicious. Easy to make! Delicate and pretty for a spring lunch. Great recipe! 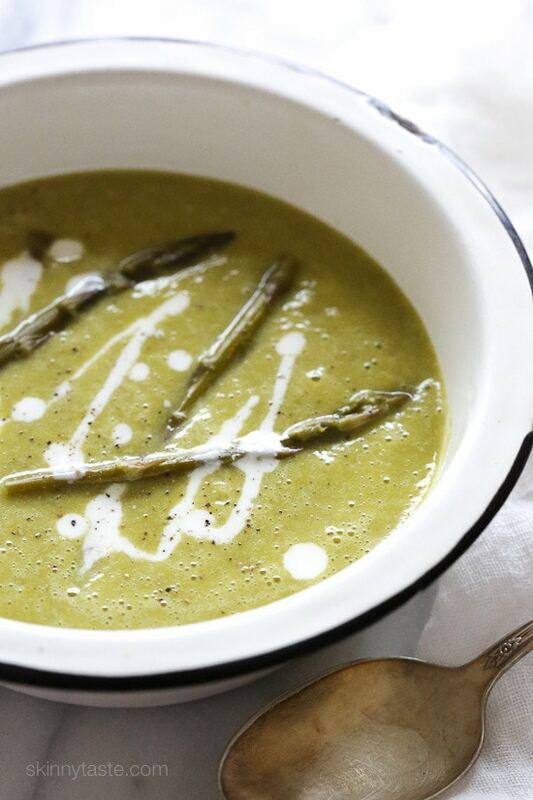 Also made with following changes and had good feedback.https://www.skinnytaste.com/cream-of-asparagus-soup-2/My changes to recipe:Added a small boiled potato (chopped) to asparagus and onions before blendingWhen simmering, added two thin slices of Dubliner cheese, on 1/4″ thick slice of Swiss cheese chopped into small cubes, Added small fingertip of shredded parmesan.Used 1/3 -1/2 container of nonfat greek plain yogurt as cream substitute.When blending with hand blender did not puree smooth but left it a bit of a slurry with some very small bits of asparagus throughout. This is the first time I’ve made a homemade “ cream of …” soup. My husband and I both enjoyed it so much we went and bought more asparagus to make another batch! 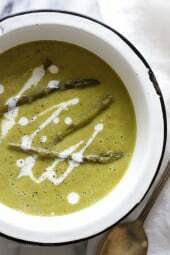 Thank you for a nice Spring soup recipe. Absolutely LOVED this recipe! It takes me back to our honeymoon in Ireland eating asparagus soup. They puree ALL of their soups, it was so weird to me, but I fell in love with the concept. The asparagus soup was my FAVORITE there. This was just like it. This soup is SO delicious and easy to make! Yum! I just made this and it’s so good! The only things I did differently were using 4 cups of chicken broth and 2 cups of vegetable broth because I ran out of chicken broth. I also added a clove of minced garlic with the onion and used FF Greek yogurt since I didn’t have sour cream. Even my somewhat picky 3 year old is enjoying some right now 🙂 Thanks for the great, simple recipe! I have made this recipe several times. Sometimes exactly as printed sometimes adding a few roasted veggies and spices. When I’ve purchased tasty asparagus it seems to be great as is. A few times I think my asparagus lacked flavor and I added some roasted garlic, onions, red pepper and spices and it was delish! Lots of asparagus from the garden and this was the perfect resolution to use them. Put in 2 small potatoes and used porcini mushroom bouillon cubes instead of chicken broth to make it a Lenten dish. Thank You again for another truly delicious recipe. This soup is amazing! The whole family devoured it. We will be making this often. I roasted 2/3’s of my asparagus in the oven first with olive oil spray, Montreal steak spice & garlic. And hands down this was the best soup I’ve ever had!!!!! This recipe was great. I added a few things to it to add some flavor. I roasted 1 bunch of asparagus and boiled the other as said in the recipe. I roasted garlic and bell peppers with the asparagus as well and added them. I added 5 cloves of roasted garlic and 1 large red and 1 large yellow roasted bell pepper. 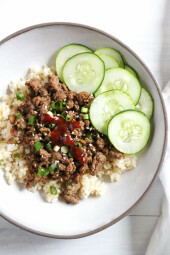 This added much needed flavor and a hint of sweetness from the peppers. Great soup. As others have noted above it’s all about the proper amount of seasoning. Dishes like this let the actual produce shine through! Sometimes the produce itself just isn’t that tasty out of season (tomatoes anyone?!?) so they will naturally need more seasoning. A little hit of acid (lemon juice) on finishing was all it needed at the end. Oh, and I second Gina’s recommendation on getting a stick blender. I broke the piggy bank a few years ago and bought and All Clad variable speed. Unequivocally the BEST and most used kitchen electric I have ever owned- the blender never comes out anymore. This soup is incredibly good. And, so simple to make. Another secret: it keeps well for days in fridge.I’ve shared the recipe with four friends.And, I went to Barnes and Noble and snagged two of her cookbooks. Very impressed with site and recipes. Made this for dinner tonight, it was soooo good! I modified it slightly by adding garlic, a little more sour cream, and a half teaspoon of tumeric. Delicious! Will be making again! VERY easy, I added a little more onion as I chopped too much ( should have been 1 C chopped, and I put in 1 1/2). Other than that, followed directions exactly. Will be my new Go TO. Thank you. MMM, I made this soup and I love how easy it was to put together. This is very tasty. The only thing i added was some garlic when i sautéed the onions, Love love love it ! Really liked it. Can it be frozen? I’m planning on trying it this week! 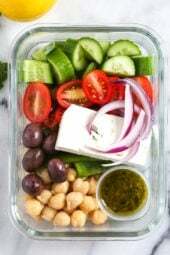 Has anyone tried with Greek yogurt instead of sour cream? Would that work? This was SO good and so simple. Thanks Gina! Made this tonight after a long day at work and it was so delicious! !I’m so glad I made myself stills at the supermarket to pick up the asparagus!! Thank you for making my long day turn into a relaxing evening! This soup was DELISH! I did top it off with freshly grated Parmesan & I have been eating on it all week long! I can see why some would comment that this soup might be bland. After reading the ingredient list, I knew immediately that I would add a clove of fresh garlic as my onions were sweating. I also used leftover grilled asparagus along side the raw fresh asparagus. (It was grilled on the BBQ with a little olive oil, salt & pepper.) My soup turned out great. I think it was the grilled asparagus that really kicked up the flavour. I also think people really need to season season season!! I seasoned once I threw in the raw and grilled asparagus with the onions, and I seasoned again after hand-blending.I blanched some of the asparagus tips on the side and threw them in the soup at the end for texture.I’m giving this recipe 4 stars because it’s super simple and serves as a great base for adding and experimenting with different flavours. Next time I want to try adding a little fresh basil! And I’m thinking that adding a carrot or using leeks might be interesting. Overall, I recommend people roast or grill a portion of their asparagus bundle first. Delicious! I loved it! Added plenty of pepper and also some garlic salt! Wonderful and so light and healthy! Loved this recipe!!! My husband and I had it earlier tonight with Carbquick biscuits on the side. It had super flavor like all of the Skinnytaste recipes that we’ve tried thus far. We will definitely be having this soup again! Thank you Gina! You’re welcome Karrye, glad you enjoyed it! 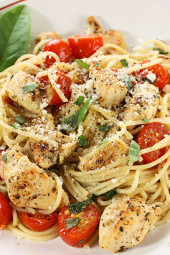 making this for dinner tonight (meatless monday) with a salad and baguette. I used a combination of some asparagus stock I made this spring and homemade chicken broth from the crock pot last night. My husband grilled some asparagus last night so all leftovers are going in. After making this it was very bland and tasteless. I had to add a lot of salt and pepper. Also added some crumbled bacon, and parmesan. We did not like it. Every body has different tastes,, now you know not to make it again.